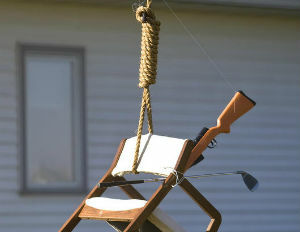 A Minnesota couple hung a chair in effigy in their yard – a reference to Clint Eastwood’s bizarre speech at the Republican National Convention in August in which he lectured to an empty chair that was supposed to represent President Obama. The chair was also run through with a bayonet. Mulholland, 46, said she saw photos of empty chairs on the conservative political blog Power Line, as well as on Facebook and FoxNews.com. The idea for the bayonet came from Obama’s comment about “horses and bayonets” in the third debate with his Republican challenger, former Massachusetts Gov. Mitt Romney. Mulholland said she doesn’t consider the display a form of hate speech and doesn’t hold animosity toward blacks. She said the display isn’t meant as a direct threat to Obama. Read the whole story at the Rochester Post-Bulletin.